These orange, cranberry and white chocolate hot cross buns are a zesty twist on the traditional recipe! I do love a hot cross bun. I’m certainly not against buying them from the supermarket – you can get some really lovely ones now in a variety of flavours – but I really enjoy making my own around Easter Time. My local bakery started making chocolate orange hot cross buns a few years ago and I loved them so much I just had to re-create them at home. So where did the idea for this and orange cranberry and white chocolate version come from? My white chocolate, orange and cranberry cookies! 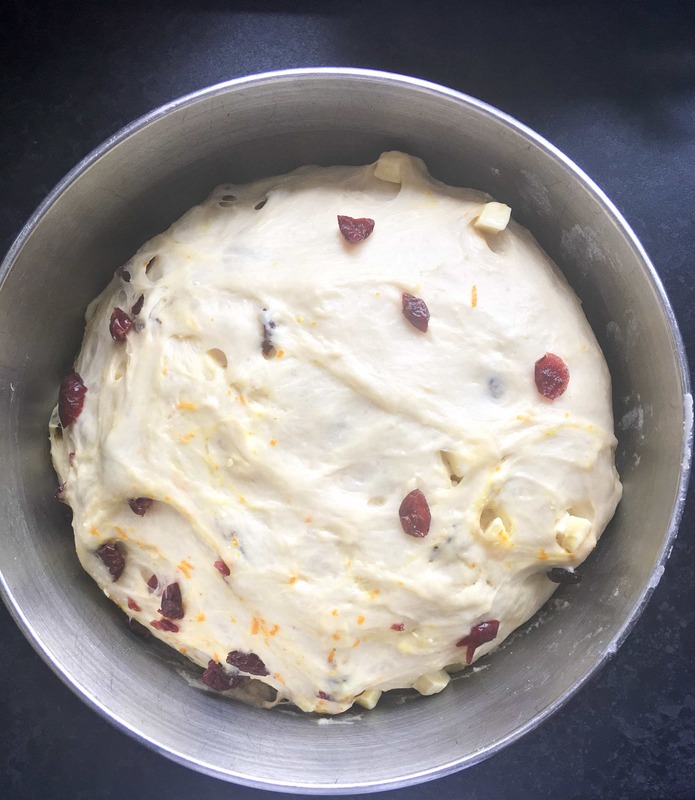 I make the dough in the morning, leave it to rest for a couple of hours before adding the fruit, orange zest and white chocolate. Then I’ll leave it again for about 45 minutes or so before shaping the dough into buns for their final prove before going in the oven. I had a few disasters along the way – but I’ve learned from my mistakes so you don’t have to! The key to fluffy and soft hot cross buns is patience. It’s crucial to wait until the dough has risen properly. Enriched dough – a dough that contains butter, sugar and eggs – can often need a little extra time to prove. Rushing this step will only result in disappointment. Trust me I’ve been there! When heating up the milk, make sure it doesn’t get hot – you only want it on the tepid warm side. Think of the temperature of a baby’s bath water and you’ll be on the right track. Adding hot liquid to dry ingredients will kill the yeast and prevent the dough from rising. Why two rising times? Is it necessary? It may be a pain, but in my experience I’ve found that adding the dried fruit and zest in the first stage rapidly slows down the yeast growth. Adding the fruit/zest/spices after a first rise will give you softer, fluffier buns! Your patience will be rewarded. If you have any leftover hot cross buns, why not make a variation on my Hot Cross Bun Bread and Butter Pudding? I would swap the dark chocolate chips for white and use good quality raspberry jam instead of marmalade. Gorgeous! This post was originally published April 2014. 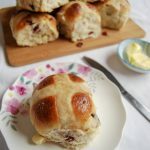 Re-published with new photographs and text 8th April 2019.
more hot cross bun recipes….. These orange, cranberry and white chocolate hot cross buns are delicious warm from the oven spread with butter and raspberry jam. The orange extract and zest adds a lovely fruity twist! Place the flour in a large mixing bowl. Add the salt, sugar, cinnamon and yeast to the bowl, keeping the salt and yeast separate. Add the warm milk, soft butter, eggs, orange extract and half the water. Mix the ingredients together until you have a soft dough. If it is too dry, add the remaining water slowly until you have a soft, but not soggy, dough. Knead for 5 mins in a mixer or 10 minutes by hand or until the dough is very smooth and bouncy.Place the dough in a lightly oiled bowl, cover and leave to prove in a warmish place for 1-2 hours or until the dough is doubled in size. ￼When the dough is ready, turn out onto a lightly floured work surface. Lightly flatten it out a little and tip the orange zest, cranberries and white chocolate chunks on top. Gently work them into the dough until they are all evenly incorporated.Place this chocolate and fruity dough back into the bowl and leave for about 45 minutes until risen in size again. Divide the dough into twelve equal portions. If you want buns of equal size, weight the dough. Mine weighed between 95-100g each. Roll each piece of dough into balls and place on a baking tray lined with baking paper. Allow enough space for the buns to double in size.Cover and leave to prove for 45-60 minutes until well risen and doubled in size. About 30 minutes before proving time is done, preheat the oven to 200C/180Fan/350F. For the crosses, mix the plain flour, salt and half of the water together, beating well until you have a smooth, thick paste. You might need to add more water, but go steady - the mixture needs to be thick so it doesn't run off the buns, but not too thick for piping. Using a piping bag fitted with a small nozzle, pipe crosses on the buns. Bake for 15-20 minutes or until light golden brown on top. While the buns are in the oven, make the glaze. Place the water, sugar and mixed spice in a small pan and bring to the boil. Reduce the heat and let the mixture simmer for a few minutes until syrupy. Remove from the heat. Remove the buns from the oven and brush them with the glaze. If cranberries and white chocolate isn't your thing, you can substitute with any other dried fruit of your choice. Dried blueberries would be lovely, cherries would also work well. 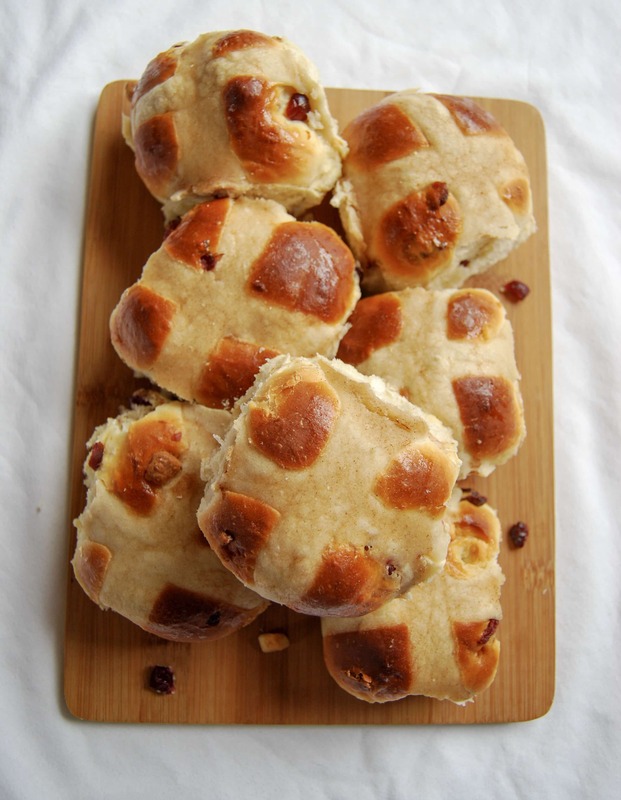 They sound good – have been trying to make Hot Cross Buns for weeks now and just haven’t managed it! Perfect recipe for this week. I like that you used cranberries instead of raisins. Big fan of cranberries in anything – these look great! 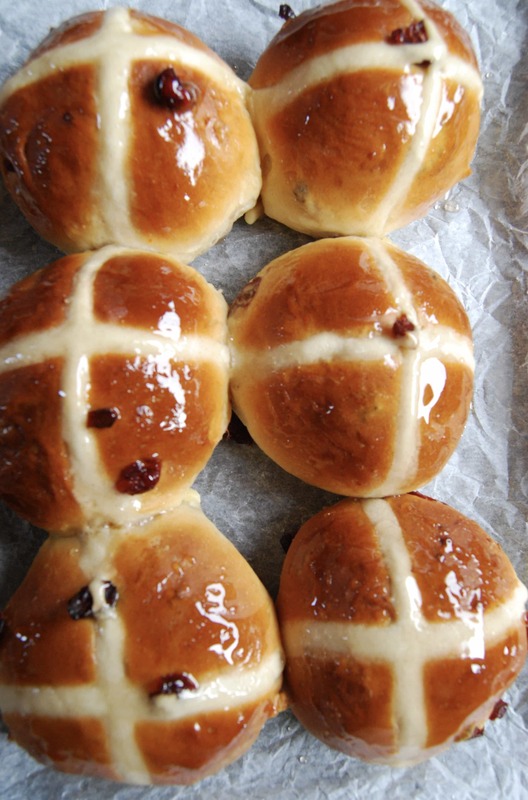 Lovely looking hot cross buns! you read my mind. I love your twist on the traditional! Thanks Camilla, you’re very welcome!